When I started at Office Depot, I wasn’t coming at it from the perspective of a part-timer who just wanted a little bit of extra cash. This was going to be my livelihood. I would have one job that’s 28 hours, and one job that’s 16 hours, and another job that’s 8 hours, and then three gigs. It gets to be a little bit too much, but I didn’t have anything else and I needed to pay the rent. I’d try to go to my manager and ask, “Can I get some more hours? Can you schedule me for maybe a few more? Maybe 32 instead of 28?” But very rarely were we able to get that. Even the full-timers were only getting 34 hours. And you can’t live on 34 hours a week at minimum wage in Seattle. Even at $15/hour it’s nowhere near enough. So I was only getting scheduled for 28 hours, and it just wasn’t enough money. I almost became homeless because of it. It didn’t matter that I was working three jobs. I couldn’t make it work and I ended up having to move in with my boyfriend eventually. And that’s the only reason I didn’t become homeless — I just lucked out on who I happened to be dating at the time. Could Office Depot, a $5 billion a year company, have afforded to give one worker six more hours a week? Of course they could. But then what they’re going to say is, “Oh, but then everyone wants that.” And to an executive that’s about getting a bonus, but to the rest of us it’s about whether we get to eat. It’s about whether I eat my 25-cent-a-package ramen, or whether I get to splurge on a salad. I don’t think it’s reasonable for huge corporations like this to hire more and more workers at part-time only. It shouldn’t be the default. If the companies were smarter about their long-term goals, they’d figure that out. Hiring everybody at part-time is not going to make you a successful business. It’s not going to promote people staying on. And when you have constant turnover, that doesn’t bode well for any sales-oriented retail. 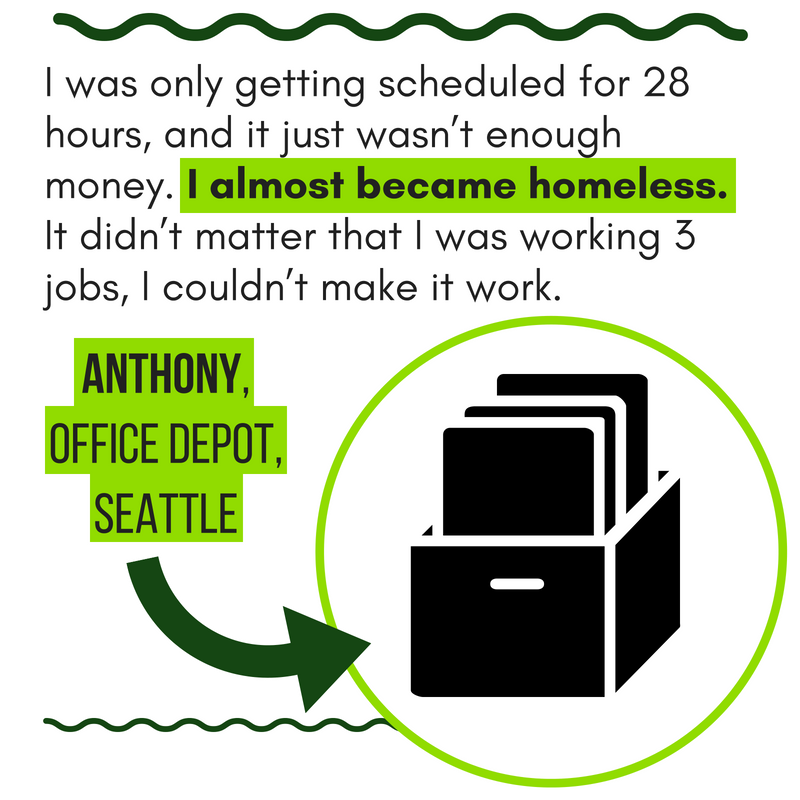 Things got way better in Seattle after secure scheduling. Before secure scheduling took effect, managers wouldn’t make it a priority to finish our schedules if there were other issues happening in the store at the time. They would make sure all the other things were taken care of first, so it could be really last minute. Sometimes they would still be working on the schedule on Saturday night, and that schedule would start the next morning, on Sunday. And obviously no one has any time to figure out what they’re going to do when they’re scheduled to work the next day. They would often just show up at the time they were scheduled the last week, and hope that it was the right one, because no one had told them yet whether they’d be working that day, and what time. That’s why we needed secure scheduling in Seattle. Because otherwise managers just didn’t understand that our needs as employees were important, and they couldn’t just be bypassed. I think it needs to expand to rest of the state too.